3. Twins are cute wherever you go. These two beautiful twin girls were not happy at all when I tried to hold either of them. They only liked their Mama's lap. My son and his wife are expecting twins this summer. So excited. I wonder if they are boys, girls or one of each. Time will tell! 4. The soil is very red! It reminded me very much of Prince Edward Island. It made us ask about potatoes. They do grow them, and even cooked us some for lunch while we visited the Pimai Care Points. But their stable food is corn and we got to shuck corn in both Sakubva and Pimai. They dry it, grind it at mills and cook it into a thick porridge called sadza. It holds the heat and sticks to your ribs. One woman, Constance, found it very hard to believe that we didn't have sadza in Canada. I did find a video about how to make it. 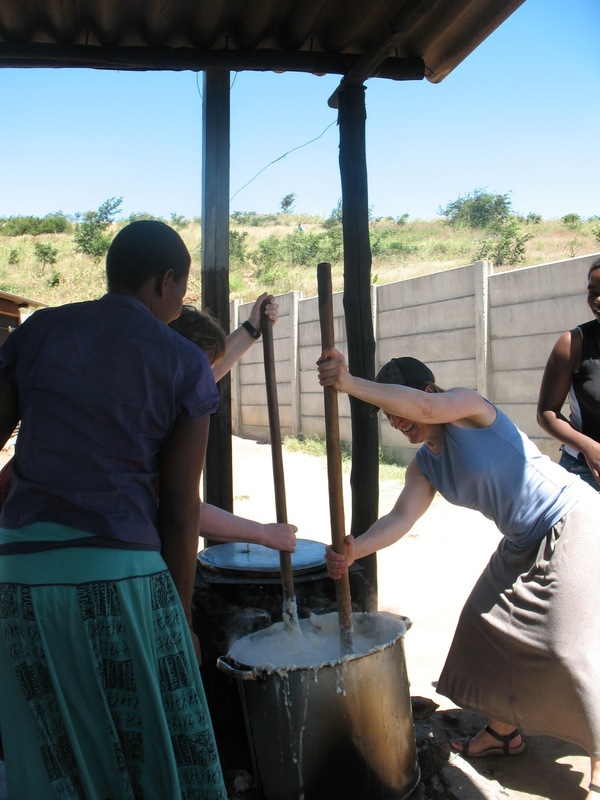 Remember though that the woman we got to meet, cook their sadza in a pot the size of a huge garden pot over an open fire and feed up to 200 children a day! 5. Any taste of home, makes a traveler happy. Hence Erin's picture with this young girl who is wearing a Toronto Maple Leaf's sweater. 7. I take water usage for granted. Water is hauled by these volunteers in these 5 gallon pails every day, up a steep hill and down a narrow path that can be very slippery in wet weather. It's about a 500 meter walk. This is the water that is then used to cook the sadza and vegetables to feed the children each day. 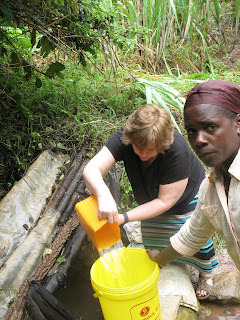 It's also used for hand washing and cleaning of the pots and plates after the meal. Hands at Work is looking into getting a well dug for this particular care point. Until then, this is what is done by the volunteers. 8. Cindy's a beast. I knew that before but she proved it again. Here she is stirring the sadza. Cindy stirring the sadza over the open fire. It must boil for about 15 minutes while being stirred constantly. 9. Timetables are important especially when they end with lunch. 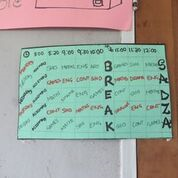 Preschool timetable found in the school in Pimai. 10. Father Matthew has a portable Mass kit. 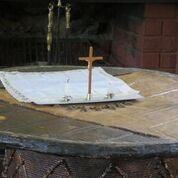 We were able to celebrate Mass with him in the living room of the guest house on the tea plantation in the Honde Valley in Zimbabwe and at the chapel at the Hands at Work Hub in South Africa. Buildings aren't needed. 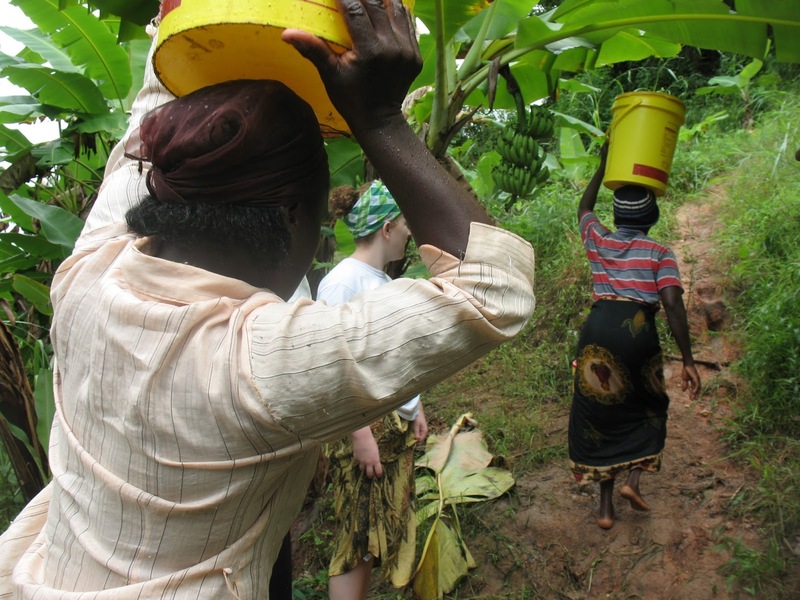 If you're looking for more blogs to read about Hands at Work and the work that they do in Zimbabwe, consider reading this one written by two volunteers from Canada who have spent time there.